It's not easy to brew for a crowd. Luckily, Toddy's commercial-size Cold Brew System simplifies the process. Designed to brew up to 2.5 gallons of cold brew at a time, this outsized brewer comes with a couple of clever analog solutions for cafe concerns—namely, efficiency and cleanliness. 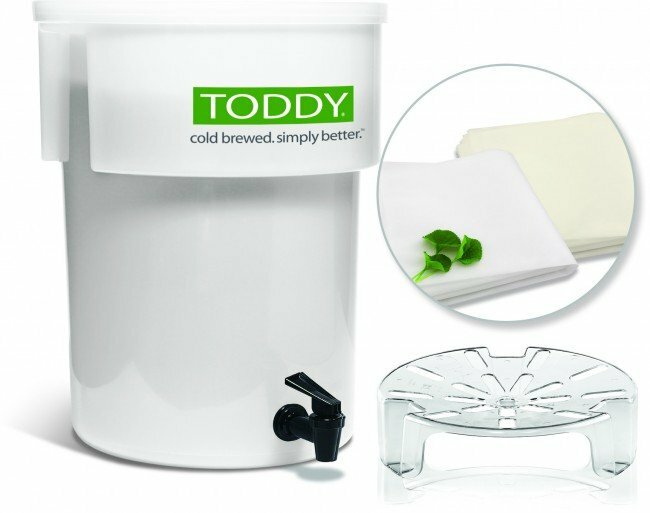 Toddy offers two-stage filtering; disposable paper filters and a reusable cloth outer strainer for unbeatable clarity in-cup. These filters fit atop a small lift plate, which enables more efficient extraction and saves your hard-working baristas the need to squeeze out the last concentrate after draining. 5 Pound Capacity - Brew up to 2.5 gallons of your shop's favorite cold brew concentrate. Lift Plate - Toddy's new lift plate makes extraction more efficient and removes the need to press or squeeze your filter bag. Disposable Filters - Large paper filters keep coffee contained to simplify cleanup.